Description: Working the hump yard. 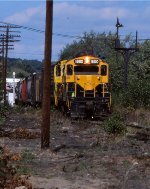 Description: Susie Q GP-18 #1800 emerges form the weeds after switching a customer on a cold but clear day in January, 1980. Description: NYS&W #1800 leads a freight past the old station in Maywood New Jersey in January, 1980. 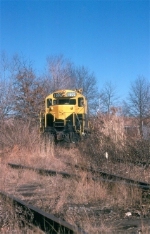 Description: #1800 passes under COnrail trackage in Saddle Brook NJ, January 1980. 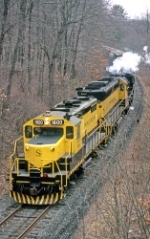 Description: Susquehanna GP-18 #1800 with the conductor riding on the steps crosses the small trestle in Rochelle Park NJ. Description: The GP 18s turned up everywhere, so it was no surprise to find one on a work train on the Hackensack River bridge. Note the FJ&G flat right behind the power. The river was still an artery of commerce-note the barge at far right. Stone was a common item transported by barge in the New York area. Description: little ferry ---standing on the 6525 is Bob Aschoff. retired NYSW engineer who just recently passed in Feb 2012. clear signals my friend. Description: BUOI with two SP units enters PC yard to drop a cut of cars passing the WS1. Description: NYSW had a way of putting together some power combinations youd never see anywhere else. Sometimes it happened in the yard, though often youd see them on the road too. This set was one only the Susie Q could come up with, at East Binghamton. Description: NYSW 1800 takes a cut of cars onto the D&H, rolling through the plant at BD as the late afternoon sun lights up its flank. Description: NYSW 1800 has brought over a cut of interchange to the D&H, taking it all the way to Terrace Drive. Once clear of the south end yard tracks, it will shove in, then return to take NYSW cars back downtown. Description: A close up look at the power on BH 1 as it works the Binghamton yard prior to going north on one of the branches. Description: BH 1 with a GP 18-C420 combo, pulls a couple of cars past an empty coal train waiting for a crew at Chenango St. Description: This was an easy enough spot to get to, but the sun angle could be a problem, especially in the shorter days of winter when it didnt come around very far. We have a back lit BH 1 crossing the Chenango River behind a GP 18 on a cold February day. Description: BH 1 rolls north at Old State Rd in Port Dickinson. This was the last winter trains would use this line. By the fall, a new connection from the D&H would be in service here, as part of a project to eliminate two overpasses, and raise the remaining structure at Bevier St, resulting in the abandonment of the ex DLW line south of here to what was once the DLW YO yard. Northern Division trains would connect to D&H tracks here for the remaining trip to the south.